GAC Business Solutions has been providing enterprise and industry-specific software consultancy services since 1983. GAC consists of several business units that specialize in three major industries; Professional Services, Wholesale and Manufacturing. 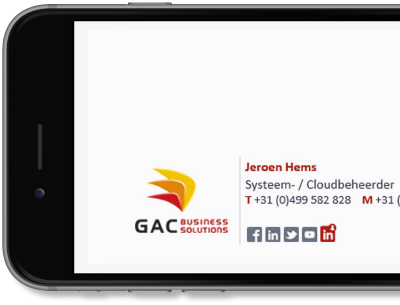 As one of the biggest Microsoft Dynamics Partners in the Netherlands, GAC offers its customers a range of Enterprise Resource Planning (ERP) and Customer Relationship Management (CRM) software solutions to manage and automate their business processes. The entire organization now loves the new, consistent look. When a company depends on their employees to manage their own email signatures, important elements will often get removed or forgotten, which becomes problematic as it leads to inconsistencies across the company. As GAC Business Solutions is made up of several business units, it was important that the organization could apply different promotional banners to each unit’s signature for events. However, this was proving too difficult to manage, meaning GAC needed a solution that would allow it to centrally manage email signatures across the whole company. GAC also chose to implement one of Exclaimer’s on-premise solutions, Signature Manager Office 365 Edition, alongside Exclaimer Cloud - Signatures for Office 365 to provide additional functionality like letting all end users see their Office 365 signature before sending an email.